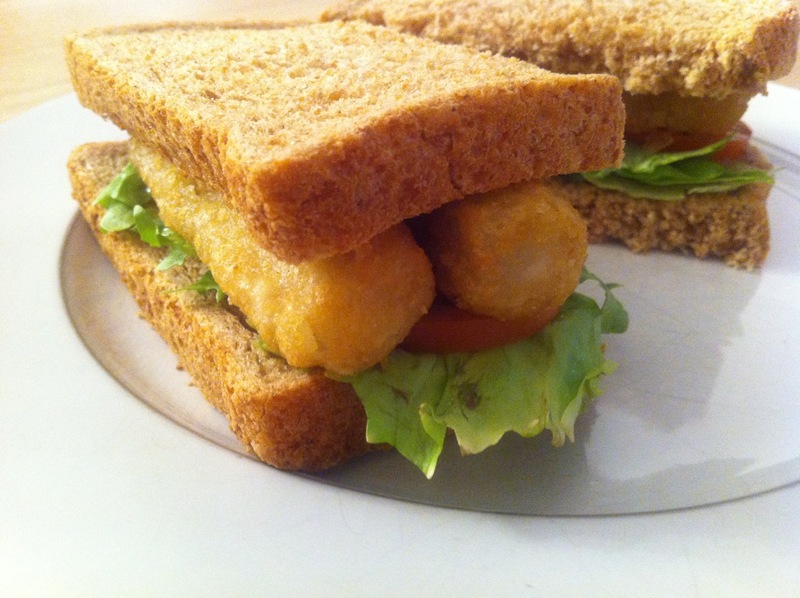 In praise of the fishfinger sandwich. I’ve been parenting solo this week. This will be the second week this month. As my husband would say ‘we’ve had a bad run of it’. This is the nature of his job and I’ve had to get used to it. As the children have got older, it has got easier; they don’t wake up in the night, they don’t cry themselves to sleep because daddy isn’t there and they are confident he will come home again. As another local mother whose husband is often only there at weekends once said to me, ‘you get into a routine’. And you do. I try to keep things as ‘same as usual’ as I can, making sure they still get to football training, brownies, cubs and swimming. Even more so than normal, as in an average month I do allow myself to drop the ball occasionally. We don’t speak about dad much while he’s away. There’s a huge elephant in the room – but we’re ignoring it. What I’m not great at though on these occasions, is looking after myself. I love food and I’m fussy about restaurants. But when I’ve just spent the last half an hour making three packed lunches, I can’t be bothered to whip up a gourmet meal for one. Packed lunches – I hate them. I made my own lunch every day from when I was 14 years old. Opening my lunchbox at school, I always wished I would find something other than a badly made door step sandwich (mum didn’t do sliced bread), oily with peanut butter, slightly squashed and sweating under the clingfilm. I don’t know what I was expecting but somehow I always hoped that the packed lunch fairy might have been and furnished me with something slightly more interesting, having utilised better presentation skills. Whipped goats cheese with sun dried tomato and a few rocket leaves maybe? So when there are two of us at home, I make an effort. I don’t eat meat so the traditional (and easier) meat and two veg are out. Mr N once ate guinea pig in Peru, I’m pretty sure he’s tried haggis and we’ve shared deep fried chilli crickets in Mexico so he’s not afraid of a few lentils and an experimental beetroot risotto. But when you’re by yourself, it’s late and you’re tired, this kind of meal just isn’t going to cut it. There have to be some advantages of being by yourself. Green and Blacks white chocolate and wine for dinner probably being one of them. Sometimes I just go to the fridge and gather together what is in there. It is picnicking in your own home and normally it wouldn’t be allowed. When I want something a little more nutritionally balanced though, I don’t think you can beat the fishfinger sandwich. It’s the only time I ever eat ketchup but it’s delicious, reminds me of my student days and is somehow comforting. Go on, you know you want to. This entry was posted in Food, Humour, Uncategorized and tagged Children, food, Humor, humour, Parenting, recipes, single parenting by Emily Nicol. Bookmark the permalink. My dad always made me liverworst (I know it’s not spelled right, but you didn’t have to eat it) and mustard sandwiches that would sit in my lunch sack at room temperature until 11:25. I remember the time because that’s when I would open my sack and hear everyone go “Ewwww!” A bitter-sweet moment of sorts, depending on who was sitting next to me. I wouldn’t be too sure. The ingredients label took up the whole side of the liverwurst tube. There’s no telling what was ground into that stuff. I’m sure the warm mustard killed anything harmful, though. I mean, look at me now…. oh man, that explains it…. Arf at the liverwurst conversation! I have fond memories of stuffing the unwanted parts of packed lunches up inside a loose ceiling tile in our home room. Everyone did it. The cleaners probably found it less endearing once they discovered the pile of rancid corned beef sangers that had accumulated there. I was expecting there to be a Suspiria-style rain of maggots during register, but it never happened. Perhaps those sweaty sandwiches were too fake to rot, like McDonald’s burgers.